Ninetheme has built over 100 Responsive Modern WordPress themes since 2012 and we’re working to create even better things. Taking the 7500+ customers and 11,000+ product sales into consideration, we’re now working with a greater motivation to deliver even better service than ever. Our team is always improving their skills and also aims to keep the customer satisfaction in a higher level. We would be glad to see you among us. Thanks to Bootstrap, which works in a perfect harmony with the Page Builder, all the template parts that you may need are ready. All you need to do so is just pressing a few small keyboard keys, thanks to the a drag-and-drop feature. All processes like uploading your logo in our templates take place with just a click. Mouse itself even can be enough usually. It's completely up to you to edit or hide the header and footer. Some things must be simple! After seeing our Envato customer reviews, which are filled with compliments, we're sure that you will join our family. You can find our support team here ( https://9theme.ticksy.com ) and you can click on the link to see the customer reviews. Envato and WordPress have created some miracles in the last few years. Creating a website a few years ago was much harder than it is today. We use WPBakery Page Builder ( formerly as visual composer ) and we do not consider leaving unless seeing a bigger miracle. We have been using our own template structure for 6 years. Being simple and understandable has always been our basic subject. We're counting days to distribute freely the simple functions and readable code blocks for all levels of software. It's a really good theme and the support team is great: they put a lot of effort into helping. Recommended! Thumbs up to NineTheme. They have blown me away with awesome customer service. Super fast response rate even made updates in adding "functionality" to the theme from some of my inquiries. I really wasn't expecting the service that I received, by far the best customer service for any theme that I've purchased from Envato. The layout is great and perfect. The customer support is above and beyond. I am by no means a word press expert and even I, with help from customer support, made a beautiful landing page with lots of details. I asked customer support for a lot of help and they were right there with me. Really made it easy to get landing page/wesbite up and going. Customer support was super helpful and patient! Thank you so much. Theme is beautiful with lots of functionality and customizable features. I've been very pleased with customer support! They are very responsive, helpful and friendly. I am not a web person and they have made building my site much easier! on how to you can use a template as you wish. Ninetheme was ever a hardworking team since opened his eyes to life. We would not have succeeded that without the advice and constructive criticises of our customers. What Should We Look For When Purchasing a WordPress Theme? Stay in touch with our innovations. We always work! 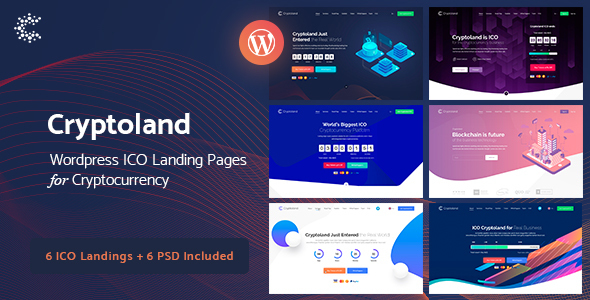 To introduce your cripto productions, Cryptoland is the theme that you’re looking for so far, providing a powerfull and unique design. 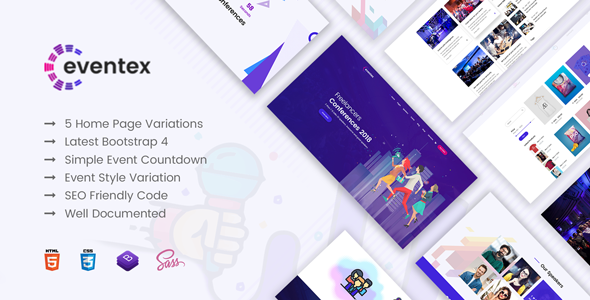 Eventex – Events, Meeting & Conferences is a modern responsive WordPress theme built with bootstrap framework for conferences, events and webiners.